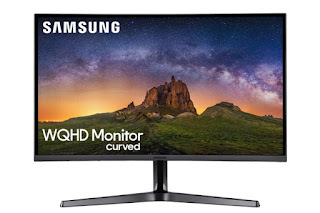 Samsung Electronics released Samsung CJG5 its new gaming monitor with curved display at Gamescom 2018, commencing from August 21 to 25. Samsung is exhibiting its advanced gaming monitor line-up equipped with super ultra-wide CHG90 experience zone under the theme, “Wider View. Winning Play.” Held in Cologne, Germany, Gamescom is one of the world’s largest gaming trade shows that attracted more than 350 thousand visitors from more than 50 countries, last year alone. 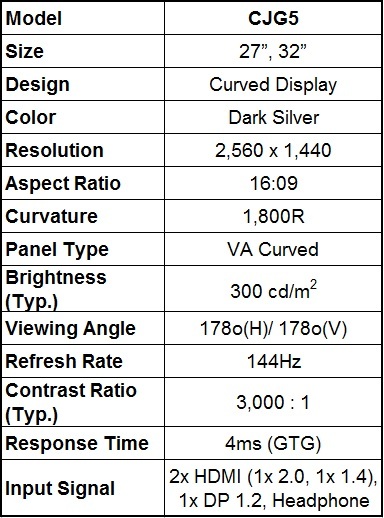 The newly-developed CJG5 32-inch(C32JG5) and 27-inch(C27JG5) Monitors feature Key Gaming Technologies such as WQHD High Resolution(2,560 x 1,440), curved display, 144Hz refresh rate and a high contrast ratio. Globally available in the third quarter of 2018, the bezel-less, game-optimized CJG5 provides a completely smooth and immersive gaming experience at a reasonable and affordable price backed by Samsung’s technology expertise.